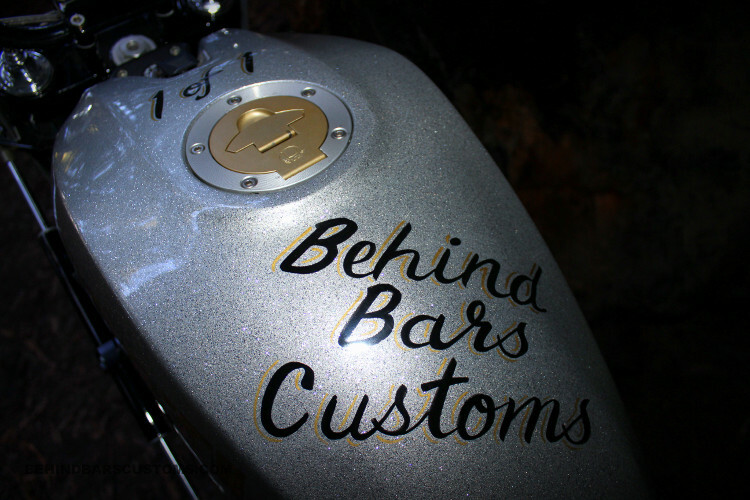 John Goldsberry of Behind Bars Customs has quickly become one of our favorite people in the moto industry. 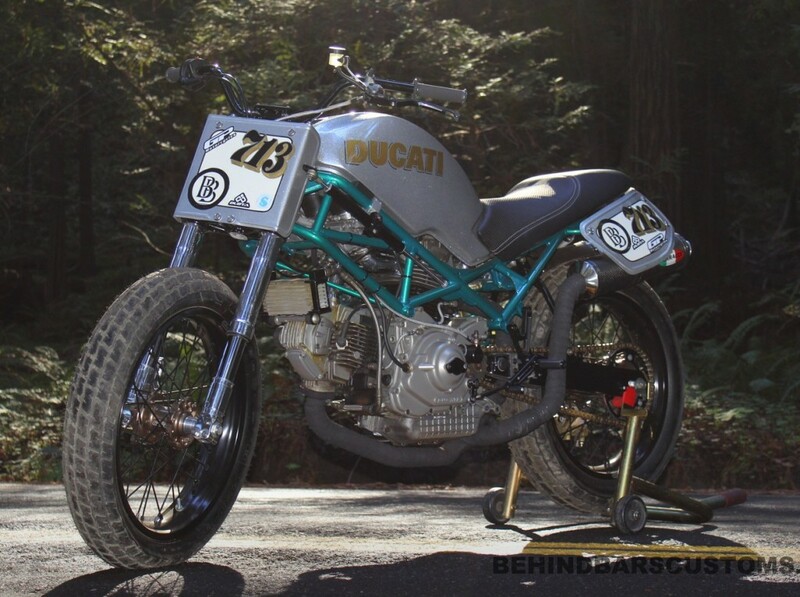 At the age of 23, he became the (then) youngest Ducati Master Tech in North America. He works at San Diego’s GP Motorcycles by day while building Ducati fire-breathers by night. 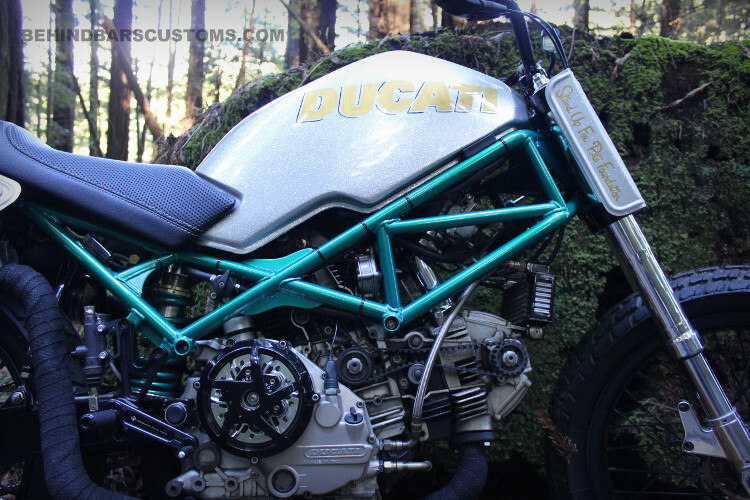 His beastly Ducati Multistrada, Project Multipass, was one of the most popular bikes we’ve ever featured. 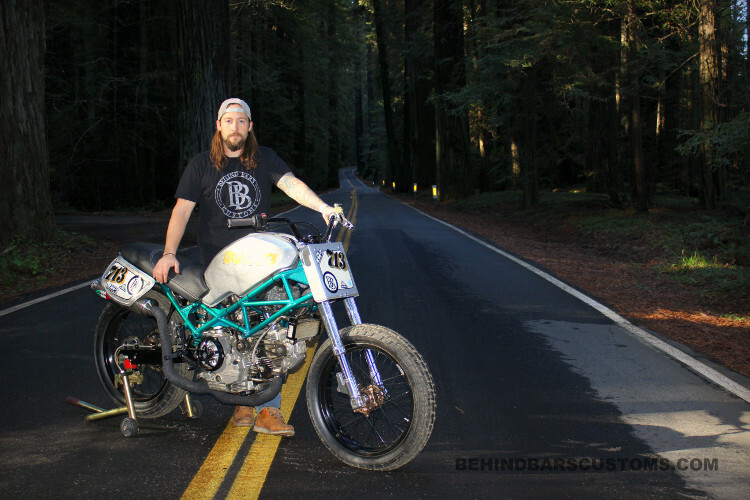 And John doesn’t just build these burly Ducati super hooligans — he rides and races the hell out of them. In fact, he broke the frame of Project Multipass jumping it on a motocross track — 100% points for sending it so hard, John! 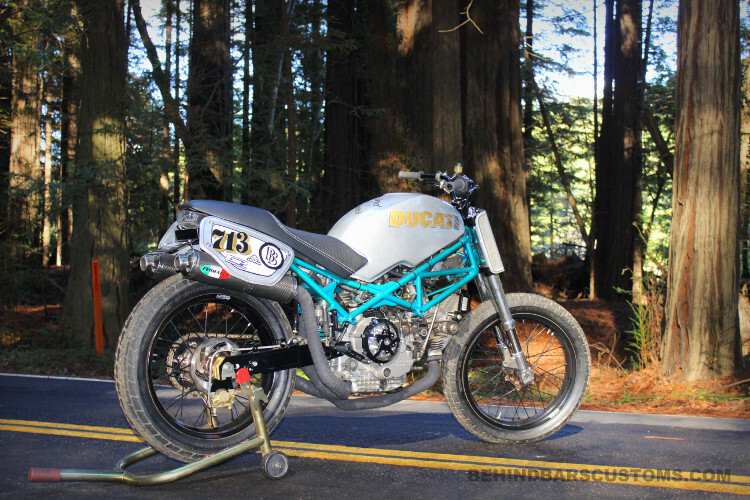 What we wouldn’t give to twist the throttle on this Ducati Monster street tracker! Below, we get the full story from the man himself. 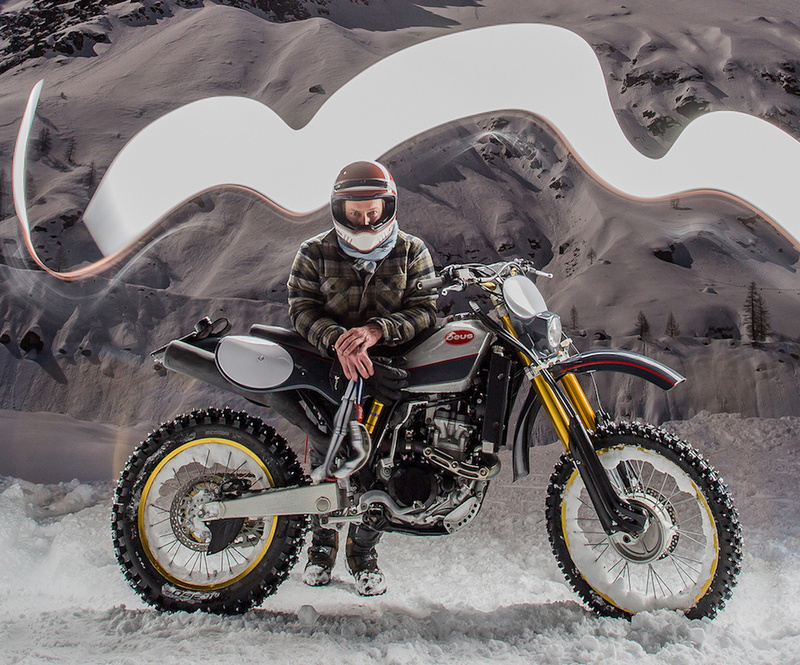 – Please tell us a bit about yourself, your history with motorcycles, and your workshop. Well, I have been working at Ducati dealers since 2006 and continue to be active in the dealer loop. My wife and I moved from Los Angeles to San Diego in February 2017 and I joined the team at GP Motorcycles. 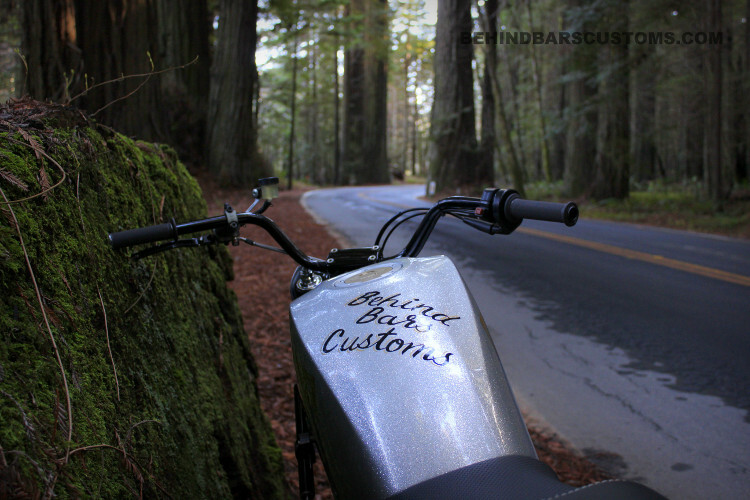 Most of my time is dedicated to the dealership, but the rest of my time is put into Behind Bars Customs. I moved everything from my small workshop in Los Angeles and set up a little space at our new home here in San Diego. It is very nice to be able to come home from a long day and go into my little work space at home with one of my pups. I grew up riding dirt bikes, then started stunt riding and now I’m trying to focus on hooligan flat track racing. I’m excited to put more time towards bike builds, racing, and the brand we are trying to build. Long-term, I hope to grow enough to dedicate 100% of my time towards building and supporting all of our customers’ needs. 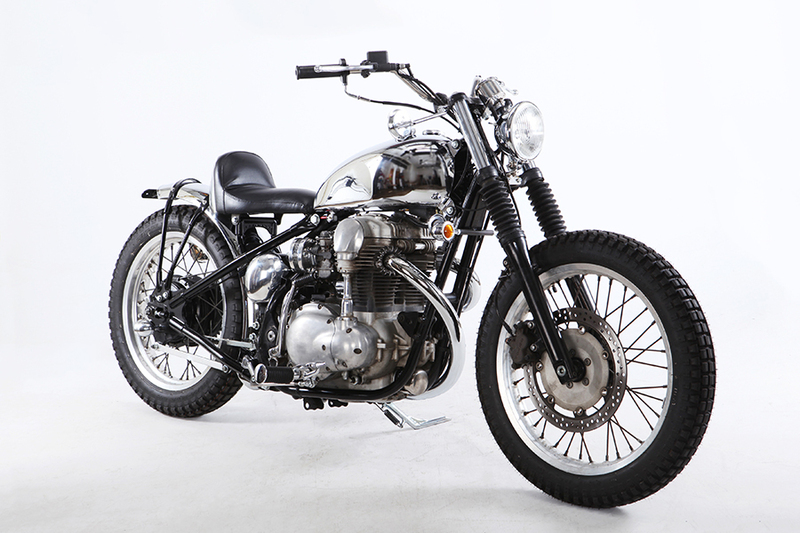 – What’s the make, model and year of the bike? 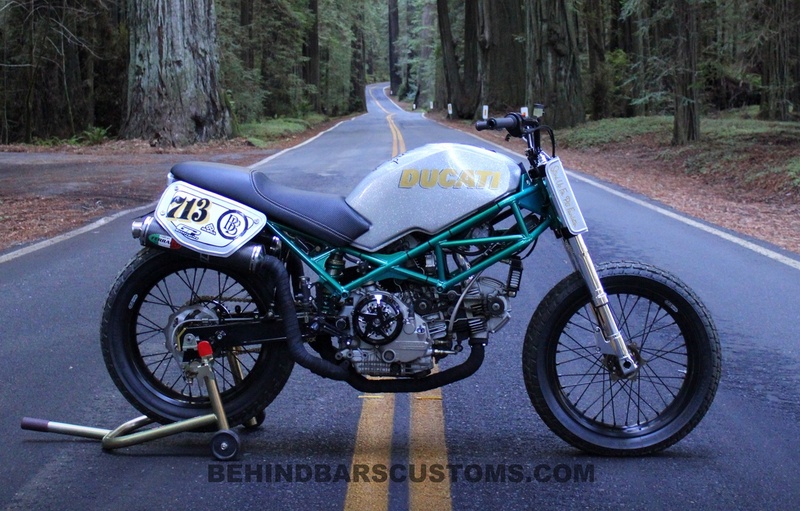 1995 Ducati Monster 900, now named Project Smart Tracker. – Why was the bike built? The main reason I built the bike was because I wanted a new bike to race. My last build, Project Multipass, served its purpose well. 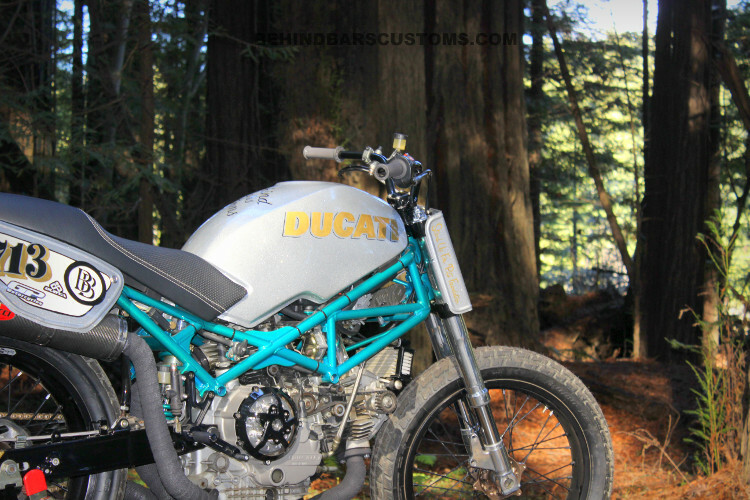 However, after I broke the frame jumping it on a motocross track, I decided to use a Ducati Monster 900 for my next build because it’s smaller and nimbler. I also learned where to brace the frame on Project Smart Tracker to ensure it could withstand the abuse I planned to put it through. That was my original goal, but as I was building it, I decided I also wanted to have it featured in some motorcycle shows when possible. 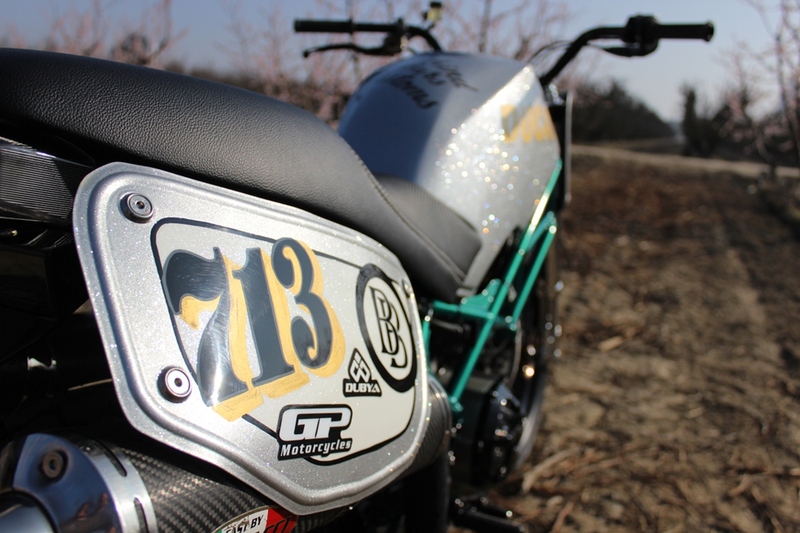 We just got back from The One Moto Show with this bike and couldn’t be happier with the reactions we received. We are very excited to finalize a few things and hit some races with her! 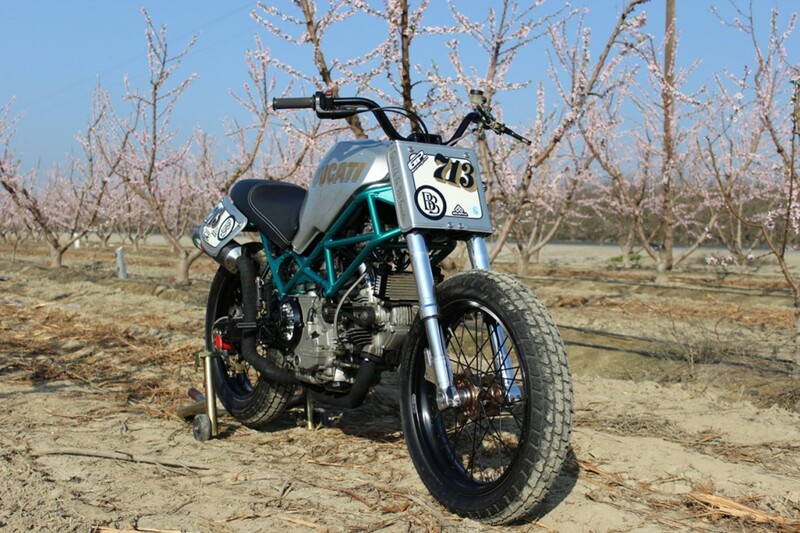 The plan is to participate in a few flat track races and maybe test her out in TT races too. – What was the design concept and what influenced the build? 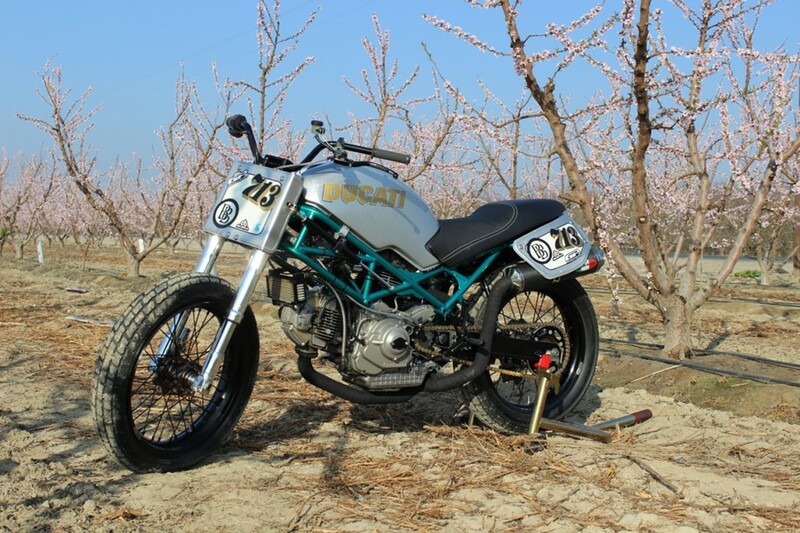 The main focus was to take a M900 and build it into a functional hooligan race bike that is also street legal. I wanted it functional and pleasing to the eye but at the same time retaining some of that classic look of a Monster 900. I also wanted to have a mix of old parts with the new to retain some of the classic feel. 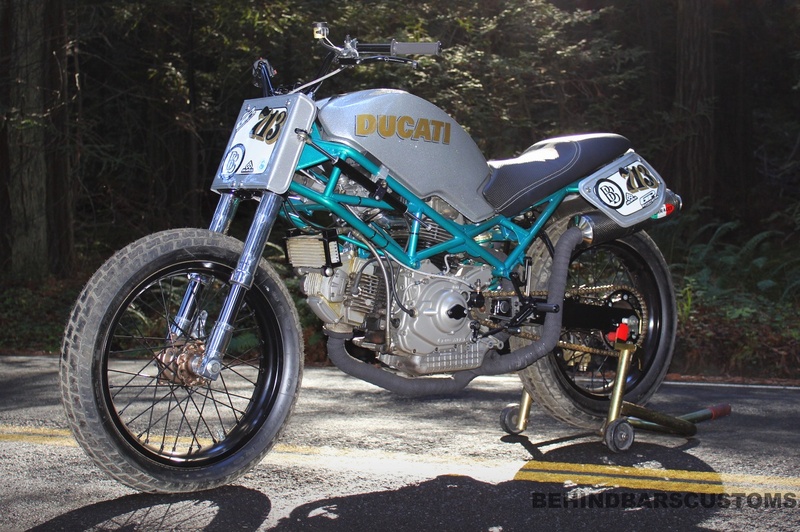 I love older Ducs and some parts you just can’t get anymore, so to replace them is against the rules in my book. 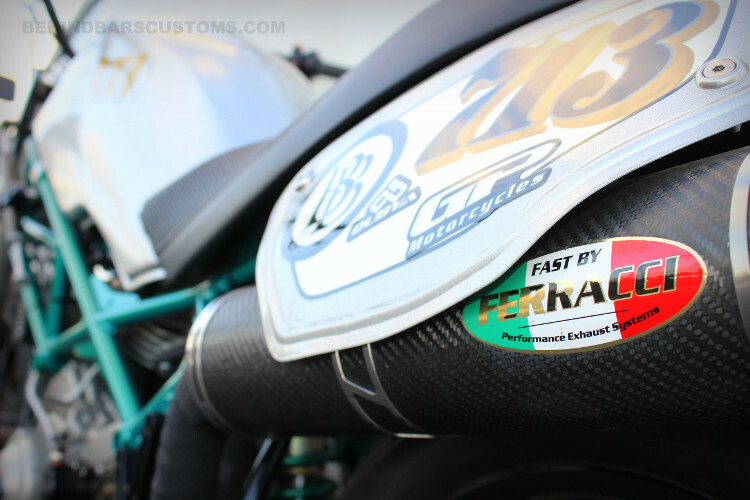 A great example of this is the worn high mount carbon Fast By Ferracci pipes, which we took apart and repacked, but kept on the bike, worn sticker and all. Regarding design aesthetics, I tend to prefer a grungy, functional feel, but I also appreciate timeless pieces. 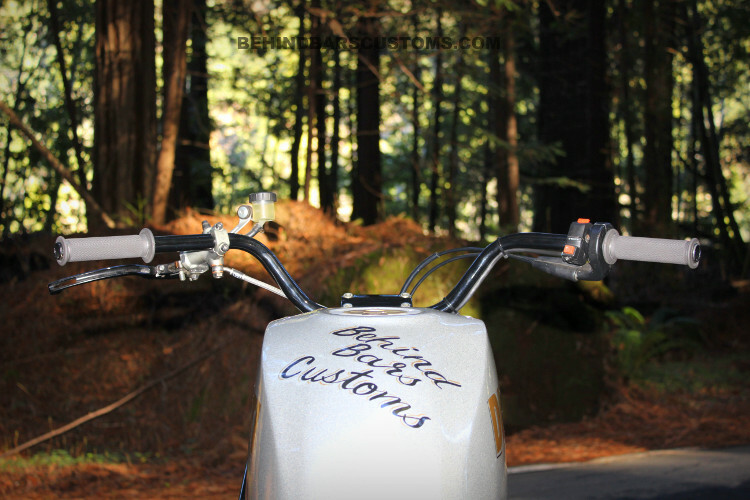 I wanted to maintain my style, while also paying homage to Paul Smart’s 1972 race bike. His desmodromic 750 boasted a heavy silver metal flake paint job, white number plates, a gold stripe up the tank, Ducati in red on the side fairings and the now famous blue frame or green depending on who you ask. 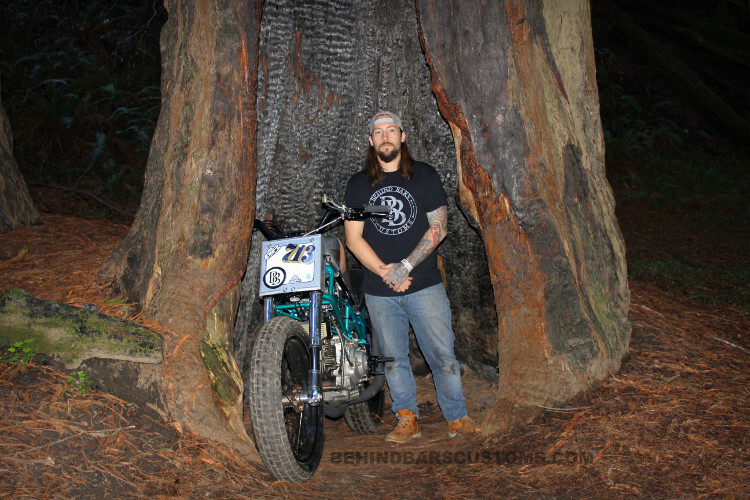 – What custom work was done to the bike? Well, I will start at the bottom and probably the most important to flat track racing. The wheels are one off that we had Dubya USA build for us. They were excited to help make what we needed and made it a painless task on our end. Dubya put together 19 inch hoops with Talon hubs, Talon sprocket and Galfer wave rotor in back. 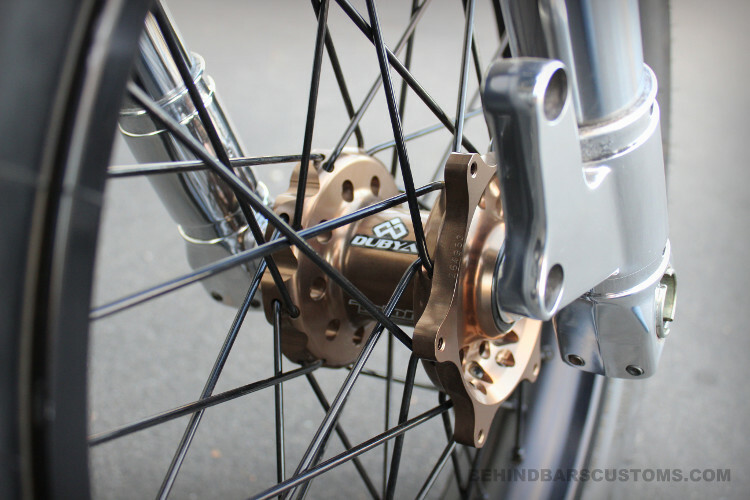 The front hub is set up to run a single front brake rotor for the days you need to get to work in style. The wheels are wrapped in Dunlop DT3 tires sourced from Race Tire Service. We wanted the bike to be competitive so to ensure we met criteria for races, we didn’t change any geometry of the frame. However, we did brace the frame in the center and at the neck. This bike will be seeing some abuse with some flat track racing and possibly some TT racing so making her strong was important. We are hoping the frame is not a worry if we send her off some jumps. After bracing the frame, we shaved some of the no longer needed frame tabs as well. The number plates on the bike are not plastic plates we purchased and bolted on. We hand-formed them to make sure they were original to this build. We built brackets for the side number plates and the front number plate was made to simply bolt to the OEM triple trees. We decided to retain the original seat and we brought it to Arroyo Brothers to make a new seat cover for us. We wanted to keep the seat clean and simple and they knocked it out for us. One of the other important design changes, was narrowing the fuel tank seven inches. The tank used to stick out 3.5 inches on each side, which inhibited the ability to get up on the bike and have your knees flush against the tank. Clearly, that was not going to work, so we fabricated the fuel tank to make sure the sides were smooth and flush with the frame. This change was done for functionality, but also enhances the bike’s aesthetics. 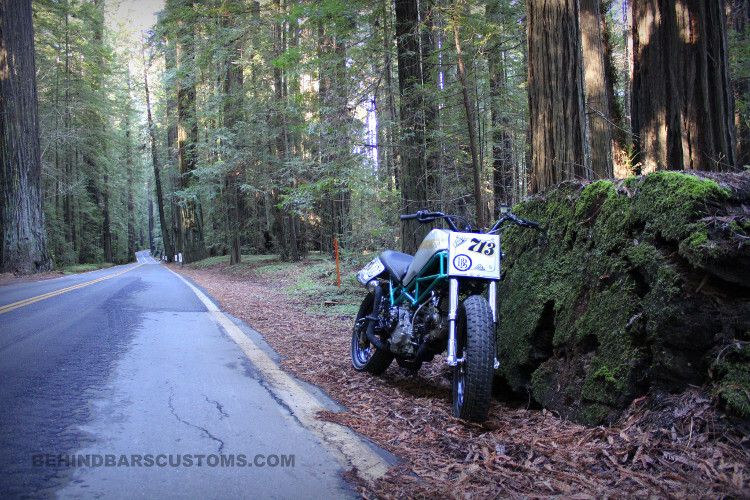 We tested multiple bar set ups and ultimately, we went with Emgo classic flat track bars. The electrical was cleaned up along with a few electrical components being relocated. We will be running a mini light bar mounted just under the bottom triple tree for street use. The paint was completed by an amazing painter in San Diego by the name of Len Lochmiller. I asked him for a heavy silver metal flake with white metal flake number plate backgrounds and he exceeded my expectations. Not only did he do a quality job he also completed it in our ridiculous nonexistent time line. 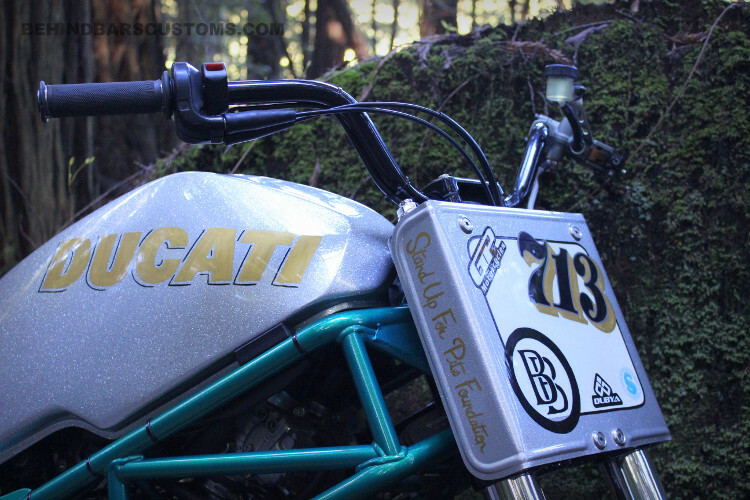 The lettering and numbers on the bike are all hand-painted by an amazing artist named Valerie at Light School Signs. I wanted a touch of gold in the bike, as the 750 in 1972 had a gold stripe up the tank, so I asked Valerie for gold numbers and gold lettering. I love to support local artists and there is nothing quite like hand-painted details. Powder coating was done by the awesome crew at Powder One here in San Diego. The frame is blue metal flake with a candy green top coat. In bright light it appears to be blue metal flake and in darker lighting it appears to be a candy green. The engine covers are a light magnesium color that is subtle and exactly what we wanted. We also had a few pieces, such as the forks, sent out and polished for a little extra pop on this bike. The list of things that we did to get this bike ready for The One Moto Show goes on and on. There are still a few things that we will be doing before she is race/street ready. We are kicking around the idea of running high comp pistons, blacking out the engine cases and throwing a digital speedo on the bike, but we might just scrap those ideas and start racing her! 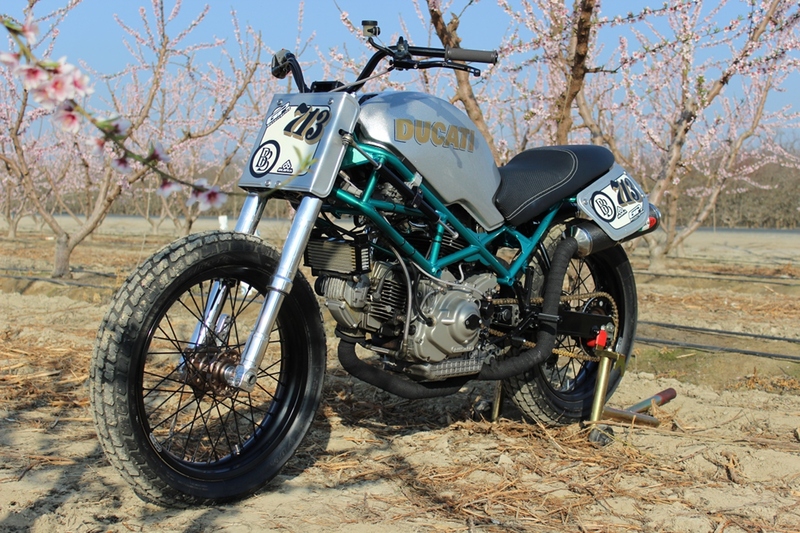 – How would you classify this bike? 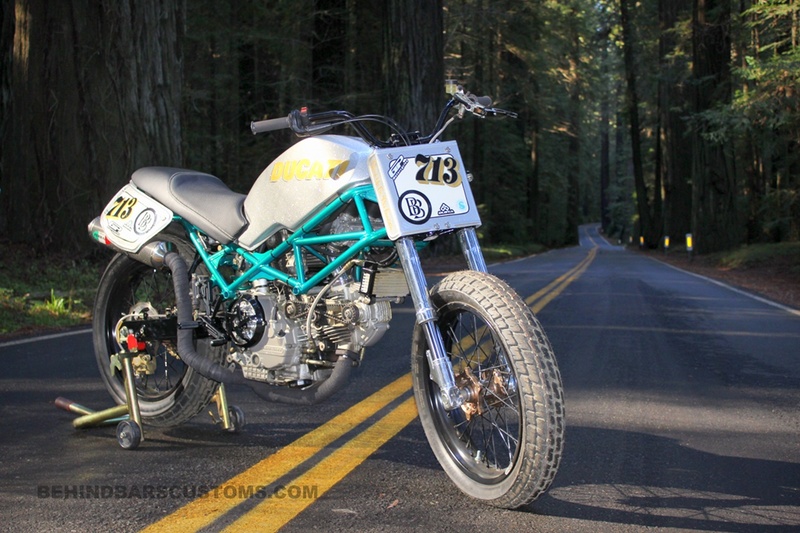 This one is 100% a street tracker! – Was there anything done during this build that you are particular proud of? 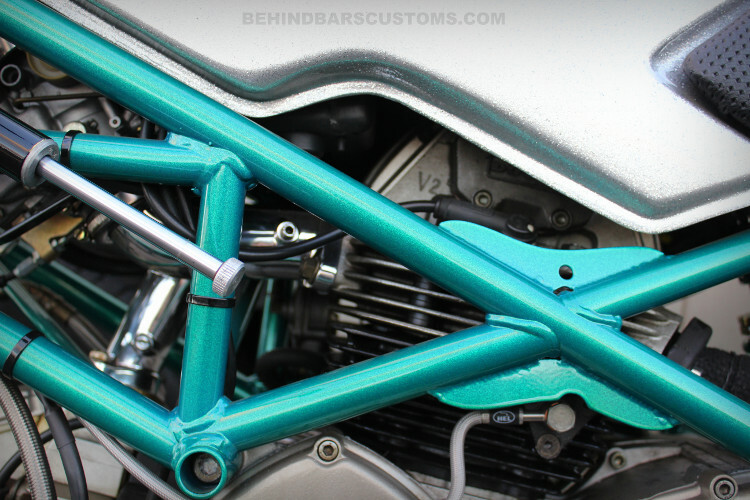 My favorite parts of the bike are the fuel tank modifications, the number plates, and the frame bracing. Hand formed metal work adds so much to a bike and there is something very special about each piece. I’m also in love with the crazy throwback paint scheme that brings it all together. I am thrilled every time we can turn a sketch into reality.